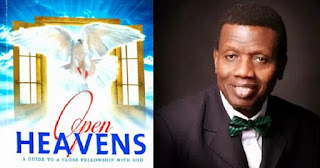 Open Heaven [9 November 2018] The Lord is my defender - Open Heavens Daily Devotional Messages, By Pastor E.A Adeboye. The psalmist also did something that I would like you to do today: he cried to the Lord. He did not pretend that all was well, like some people do. In Psalm 3:7, He prayed that God should arise to save him. This prayer worked for David, and it will work for you also if you will not have any other god besides the Al-mightily Father of our Lord Jesus Christ. After crying to God, David affirmed that salvation belonged to Him and that His blessing was upon his people (Psalm 3:8). I pray that the Lord of hosts will defend you and your cause as you cry to Him today in Jesus name.